I live in Tucson Arizona, heart of the Sonoran desert, in a house on a hill with my cat and my partner. I am a clay sculptor using anthropomorphized animal forms to talk about the behaviors of people. Studying human behavior has always interested me. In the beginning, it was this interest in the animal forms that drove the process for me. Over time, human likes, dislikes, virtues and foibles all started to come out in my animal sculptures. A few years ago I started a series called ‘What elephant?’ This references the common refrain about the invisible elephant in the room, which could be anything depending on your situation. I had fun making animal sculptures, where the subjects portrayed, moved through interpersonal relationships to family dynamics. Sometimes, individual behaviors were politically inspired until finally the elephant grew so large that the house couldn’t contain it. I find the rhythms and cycles of working in the studio both soothing and frustrating. The nature of my medium demands that sometimes, no matter where I am in the making, the tyranny of the clay forces me to another part of the process. This can affect the outcomes in sometimes interesting ways. The delay can give me time to reconsider a choice and go another direction. Having spent my work life in the studio, it is the place I go for inspiration, diversion and meditation. The journey has taken me to many places and allowed me to look inside issues and attitudes through the medium of clay. As a clay sculptor, I have had the pleasure to display my work in galleries all over the United States. My sculptures can be found in various collections, both public and private. You can also find my clay sculptures in ASU Art Museum Ceramics Research Center, Phoenix Airport and the Houston Children’s Hospital. Whether whimsical or serious, I take great pride in creating a sculpture and derive a lot of satisfaction from people’s joy when they see it. I received my art education and ceramic training in England and Wales, where I enjoyed comprehensive training in clay methods and techniques. While not always applicable to the work I do today, I am equipped to fully manipulate the medium of clay. I was born in rural England, the West Country to be exact. Being close to nature and in a country where they love animals more than people, I quickly grew to love them too. Add to this the verdant greenness of southern England and plants became my second passion. I always had the urge to make things. This first manifested in the usual predictable areas of sewing and stitchery, then moved on to other media. The propensity to create has been with me always and has led me to learn ways to make things using variety of materials. My early college advisors encouraged me to studio mixed media, but I really loved clay. That has been my life’s work and my constant companion since. We moved back to our adopted hometown after an extended sailing vacation on the coast of North Carolina, which lasted 14 years. We lived on the Pamlico Sound and sailed, swam and loved the nearness of the water. It was a fantastic privilege to sail every day. The thousands of ducks, pelicans, otters, deer and myriad other wildlife were right outside the window over my work table. It was an idyllic setting, until it rained and water ran across the studio floor. We enjoyed our time in North Carolina but it became obvious that it was time to go home. One more cross country drive and we came to rest here in the western foothills of Tucson with coyotes, screech owls and rattlesnakes. I’m so thrilled to back in Tucson and it truly seems like my time away was just a very long vacation. Reconnecting with old friends and making new ones has been a great experience. My partner and I are both makers and as a result, our houses always end up being long term projects. This one is no different. The last two years have been filled with projects to make the place we live our own. I view remodeling a house as working on a giant sculpture. In between the home projects, I garden collecting cacti, ride horses and ride motorcycles fast on curvy roads. When we moved into this house it had two living rooms which we did not need. The one was just inside the front door became my studio. This resulted in the unconventional experience of walking in the front door of our house and finding yourself in my production clay studio. 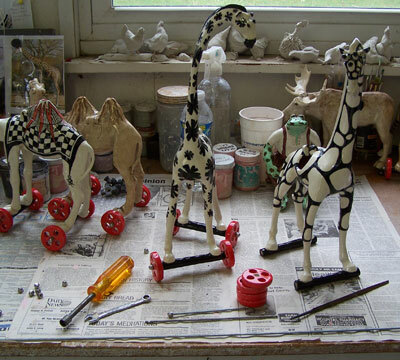 It seems normal to us and all our friends seem unfazed, so I guess we did ok.
I’ve been making wheeled animal sculptures for many years. They are an outgrowth of my very early work, dating all the way back to my early college days. My degree show featured articulated, tracked, wheeled, floating and flying vehicles in a high concept futuristic style. The interest in wheels and hatches survived this period and became incorporated into the very successful wheeled animals. My whimsical and exotic wheeled animal sculptures are entirely about form and decoration, with no underlying thematic elements. I find it satisfying to make something beautiful. There is quite enough ugliness in the world don’t you think? The drive to speed up production is always there. As any accountant can tell you, the lower your input costs, the greater your profits. I have never been able to make the leap to mass production so my work is still 100% handmade. I think this is a blessing in disguise as I really like making things out of clay. The result is that all my work is handcrafted, using quite ordinary clay working tools. Whether whimsical or serious, I take great pride in making an animal sculpture and derive a lot of satisfaction from people’s joy when they see it.